This luxury yurt in Northern California can comfortably accommodate up to three adults and two children. Linens are not provided, and guests must bring their own sleeping bags and pillows, though sleeping bags can also be rented from the on-site general store. At this glamping resort, there are shared bathrooms with hot showers, flushing toilets, and sinks. Guests must bring their own towels and toiletries. The accommodations do not include sheets and pillows. Glampers must bring their own sleeping bags and pillows to use during their stay. The hosts do have rentals available if guests decide not to bring their own bedding. There is also an on-site beer garden, highlighting Sierra Nevada Brewing Company's delicious brews, including their Pale Ale and Summer Fest Beer. Local wines from the Coloma Valley and the El Dorado Wine County are also served here. In addition, there is an on-site general store that sells beverages, snacks, beer, soda, and souvenir items. Raft both days on the fantastic Lower Gorge section (Day One) and the Upper Chili Bar section (Day Two) of the South Fork American River. Four meals are provided starting with lunch and dinner on Day One, breakfast and lunch on Day Two. Those who book two nights in these accommodations will be provided with a continental breakfast on Day One prior to rafting. The price is at $299, per person plus river use fees. This trip is perfect for rafters looking for only one day on the river. The host will provide breakfast, lunch, and dinner during this trip. The price is $199 per person plus river use fees. 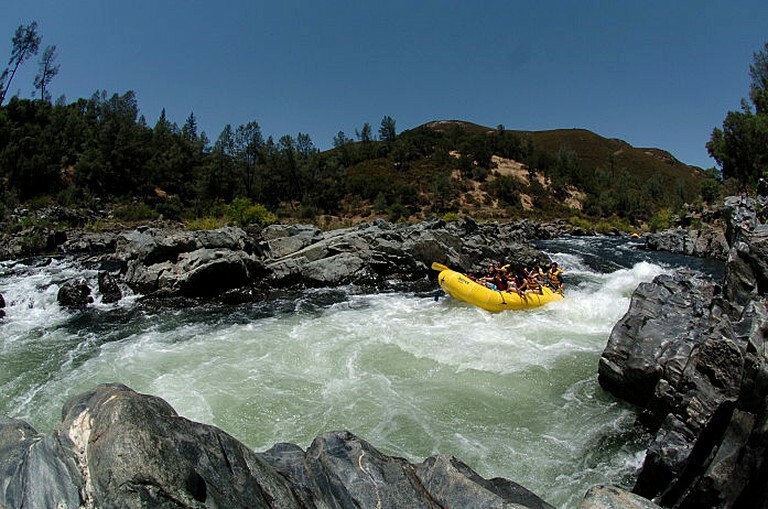 Widely regarded as the best river in the western US for family-friendly guided rafting trips, the South Fork American River features fantastic class three rapids throughout its 21-mile course in California's Gold Country. Both trips are perfect for families with youth ages seven and up, first timers and large groups. Expert rafters and novices will have the time of their lives on our trips. The cabin tents and yurt must be booked with a one-day or overnight two-day whitewater rafting trip. Meals are included during guests' stay so cooking over an open fire is prohibited inside the luxury tents and yurt. Guests are allowed to bring snacks, or they can choose to dine out at one of the nearby restaurants.